Below is an example X-ray room for an orthopedic that we offer. Perfect for high-volume environments. The FCR XL-2 can process up to 94 images per hour, yet it’s small size makes it ideal for small exam rooms or busy offices where space is limited. With this kind of speed, the FCR XL-2 can handle even the busiest periods in your office. This reader is also capable of producing high resolution (50 micron) scans for 18x24cm and 24x30cm sizes, making it ideal for Orthopedic and extremity applications where seeing fine detail is critical. Process an exam in as few as 3 steps: Simply select the patient, barcode the IP, insert the exposed cassette into your reader and you’re done. FCR systems have proven to be day-in day-out reliable, thanks to exceptional product design features and built-in redundancy that prevents issues before they occur. In fact, you can expect an uptime of over 99%. As for durability, FCR systems are well-known for their long and productive lifespans. Benefits include virtual elimination of repeat exams and lost films, lower storage and management costs plus more options to enhance images. Fujifilm’s proven technology optimizes images for display with software that meets the specific needs of private practices. Anatomical menus can be customized for a wide range of procedures. Images have excellent soft-tissue detail. 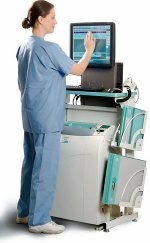 And special features such as Auto Stitching software streamline more labor-intensive exams, like scoliosis and long-leg exams.